If you find yourself in a situation requiring you to make your home wheelchair friendly, some of the changes you implement can actually make your home more attractive. The following five ideas can make your home beautiful as well as accessible for anyone experiencing mobility issues. It has become a popular design trend to have double doors for a master bedroom. Hanging doors and sliding doors are also being incorporated into home designs. Using any of these options to make interior doorways more accessible could be considered an update for your home. 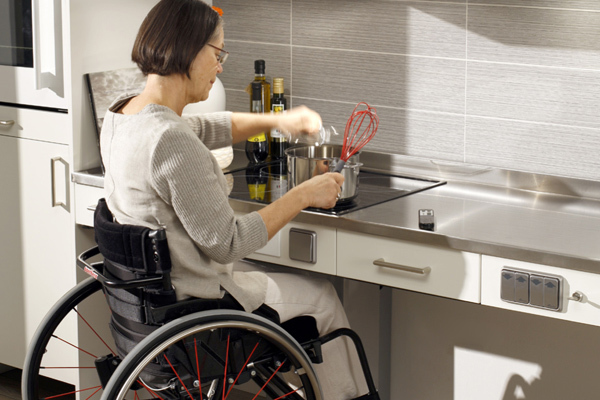 In order to make your kitchen and bathroom accessible for a wheelchair, you may have to lower your counter tops and create clearance underneath the counters. When you make these changes, you can use this as an opportunity to update the counter top material in the kitchen and bathroom. Your kitchen and bath will look more beautiful after they are made accessible than they did before. You may face your biggest challenge when you begin making your bathroom wheelchair friendly. There are several things working in your favor that will enable your accessible bathroom to be both lovely and accessible. Raised toilets have become a popular addition to bathroom designs. Curbed showers can be a space-saving, attractive and accessible part of a bathroom design. Open shower and open bathroom designs are gaining popularity in modern style homes. Although it might seem a bit unconventional for you, this design concept is certainly wheelchair friendly. You’ll have to consider the exterior landscape when deciding where to put a wheelchair ramp. If your home is near a sidewalk, the ramp may have to be put in the back or to the side of your home. Companies like Evolution Iron Works offer material options such as wood, galvanized steel, concrete deck ramps and portable aluminum ramps. You can plant shrubs to make the ramp less visible. Threshold ramps are often a convenient way to make interior and exterior doorways less challenging for someone using a wheelchair. Open floor plans with laminate or wood flooring and wheelchairs are a good match. Uncluttered rooms and minimal furnishings are not only popular, they are wheelchair friendly. Simplicity in design makes a home more wheelchair friendly. Making your home wheelchair friendly can also be a way to beautifully update your home. You can create a comfortable living space without compromising the attractiveness of your home.